Migration Mapper is meant to facilitate the technologically challenging analysis of animal movement and migration data. Migration Mapper is meant to be used by researchers, biologists, and managers to analyze fine-scale GPS collar data collected from ungulates. The workflow generally consists of: 1) importing cleaned GPS collar data in ESRI Shapefile format; 2) quantifying whether individual animals are migratory, and if so, identifying the date of the start and end of migration; 3) calculating the utilization distribution of each individual’s migration movements using a Brownian Bridge Movement Analysis; and finally 4) grouping animals into distinct populations and calculating population level migration corridors. Migration Mapper provides the user with a number of outputs including shapefiles of high, medium, and low use migration corridors and stopover sites, and analogous shapefiles for population-level winter ranges. Further, Migration Mapper spits out a table of the start and end of annual spring and fall migration for every individual animal, raster layers of the individual and population-level utilization distributions of migratory corridors and winter ranges, and shapefiles of the GPS locations used in the Brownian Bridge Movement Analysis. Understanding and mapping where animals go is of utmost importance to wildlife conservation and management. This is particularly important for migratory wildlife as they rely on connected, seasonal habitats. Given increasing levels of energy development and recreation on public lands, sprawling housing development on private lands, and increasing traffic volumes on roadways, the long-term persistence of migration corridors is uncertain. It is known, for example, that development can alter space use on winter range, affect the speed at which animals migrate, force animals to detour from established routes, and in some cases, impede migration altogether. In 2009, Sawyer and colleagues devised a method for identifying and prioritizing migration corridors, which provided a way forward to begin mapping and conserving ungulate migrations. The methodology involves a brownian bridge movement analysis of GPS collar data collected from individual animals and a prioritization analysis based on the number of animals migrating through specific areas. The framework has been adopted by the Wyoming Migration Initiative (WMI) to develop their migration assessment program, which includes identifying threats and opportunities for conservation along migration corridors. WMI pioneered this approach by assessing the "Red Desert to Hoback" (RDH) mule deer migration, a 150 mile-long corridor that is the longest yet recorded in the Lower 48. The RDH migration assessment has provided a road map for managers and NGOs seeking to sustain this corridor. It has guided the targeting of conservation easements, fence modifications, highway crossing improvement, and land-use planning on BLM lands. The issue with these methods, however, is that they are computationally intensive, and require coding and analysis skills that are beyond the reach of most biologists and managers. Many states have GPS collar datasets of ungulates, and many are currently collecting data. Although these datasets exist, technological barriers have stymied the evaluation and adoption of the new methods that would allow any manager or biologist to identify, assess, and prioritize migration corridors in a consistent way. Migration Mapper is built using R as the processing environment. R is a command line-based, open-source software for completing complex data analysis, modeling, and visualizations. On top of the R environment, Migration Mapper uses RStudio and Shiny to build an easy to use user-interface. That means you don’t need to look at any R code! RStudio and Shiny provide a framework for interacting with R through a variety of easy to use tools and functions. A computer that runs Windows. At this time Migration Mapper has been built to only run on a 64-bit Microsoft Windows operating system. We have not yet configured Migration Mapper to run on the Mac operating system. Your GPS collar data as a single ArcGIS shapefile with a column representing animal ID, or multiple ArcGIS shapefiles each representing an individual animal’s GPS collar data. Click the "download R" link in the middle of the page under "Getting Started." Select a CRAN location (a mirror site) and click the corresponding link. Click on the "Download R for Windows" link at the top of the page. Click on the "install R for the first time" link at the top of the page. Click "Download R for Windows" and save the executable file somewhere on your computer. Run the .exe file and follow the installation instructions. Go to www.rstudio.com and click on the "Download RStudio" button. Click on the version recommended for your system, or the latest Windows version, and save the executable file. Download the zipped file titled MigrationMapperv1.2.zip from the Wyoming Migration Initiative website under the Projects tab. Once you unzip this file (and, you MUST unzip this file), enter the folder title collarProcessingApp. Within this folder you will see some subfolders. The image to the right shows the first page you will see after loading Migration Mapper. This is where your GPS collar data will be imported. Migration Mapper was built to import shapefiles of fine-scale GPS collar data. Shapefiles can be imported with several individuals merged together or as unique files for each animal. If importing unique files for each animal, it is necessary that all files have identical columns, data formats and GIS projections. If importing a merged file, it is necessary that the file includes a column delineating unique animal IDs. You have two choices on this first screen. First, you can start a new project by clicking CLICK TO CHOOSE FOLDER. Alternatively, you can re-load an existing project using the button RESUME EXISTING PROJECT. The following instructions talk you through how to start a new project. Instructions for resuming an existing project are outlined in the section entitled “Updating a current project” below. To start a new project, you will need to select the folder that contains your data to import. Click the button CLICK TO CHOOSE FOLDER. A dialog box will open that you can use to select the appropriate folder. Note that sometimes this dialogue box does not pop up in front of Migration Mapper, but it will show up on your taskbar. For this demonstration, we will select one of the sample datasets included with Migration Mapper. Once you select the appropriate folder, you will see a message indicating that you’ve selected an appropriate folder. If you choose a directory that does not contain valid shapefiles, you will receive an error message. If this occurs, check the folder’s content and verify your shapefiles are located there. To choose the file(s) for import click the empty box above the BEGIN FILE IMPORT BUTTON. A menu will appear where you can select the appropriate file(s) for import. After choosing file(s), click BEGIN FILE IMPORT BUTTON to start loading shapefile(s). Next, you will need to choose an empty working directory or project folder. This project folder is where various files will be written and stored while Migration Mapper runs. Once finished running Migration Mapper, this is also the directory where all the results will be stored and available to you to review in ArcGIS or other GIS software. This directory should be an empty folder on a local drive with sufficient storage space. For instance, an elk dataset from Wyoming with 57 animals required 2 GB of space. To choose this folder click the CLICK TO CHOOSE DIRECTORY button. This will open a dialog you can use to choose the appropriate folder. After clicking execute on Tab 1, Migration Mapper will change to Tab 2. This second tab is used to select date and time information from your dataset. Here you can see a sample of attributes from the imported dataset. Note that properly identifying the date and time information is critical for the analyses. Thus, you should be aware of how the date/time stamps for each GPS location are stored. Based on our experiences, we recommend two formats for date/time information. First, date/time should be stored as text in a single column. For instance, date and times could be stored as “2015-05-26 14:01:52.” It does not matter the order at which the date/time elements are pasted together nor the type of character that separates them. More important is that you, as the user, know how the date time column is formatted, and that the format is consistent throughout the entire column of the shapefile. Second, the elements of dates and times could be stored all as separate columns in numeric format. In other words, the shapefile could contain a column for year, month, day, hour, minute, and second. Once you proceed to Tab 3, you will see a reminder about double checking the selected columns. You can see the column(s) you chose on the right side of the screen along with some sample values. Make sure you’ve selected the correct columns before proceeding with this step. If you see you have chosen incorrect columns, go back to tab 2 and add the appropriate columns. The date configuration tab is very important as it is used to indicate how your date/time information is stored. Migration Mapper has simplified this process and the only thing you need to do is to indicate the order of the date time elements. To do this, you must repeatedly choose date/time components from the drop down meanu. For example, the sample data shows a first date/time value of 2011-02-01 08:00:00. This represents February 1st, 2011 at 08:00:00 AM. We know the order of these values is then year, month, day, hour, minute and finally second. We need to choose this appropriate order from the top menu titled Choose date time elements for: date. Next, you need to indicate what time zone your date/time stamps are stored in. This sample dataset was collected in UTC which is the same as GMT so no change is needed. After choosing your timezone and making sure you have made correct selections, click the PROCESS DATES button to process the data. The next tab of Migration Mapper allows you to select start and end dates for the spring and fall migration for each animal, during each year. You can also omit specific seasons and years if the individual is not migratory or there are errors in the dataset. Note that Migration Mapper considers that the biological year begins on February 1st, and ends on January 31st. This way, if there are animals still migrating in January, it can be identified as part of fall migration. The most effective way of indicating start and end dates is to look at a graph of displacement over time. Displacement is calculated by identifying the mean x and y location from the first few days of monitoring in February or whenever you first captured your animal, and then calculating the distance (in km) each GPS location is from that location. In other words, these initial february points should theoretically represent the location of the animal’s winter range, and displacement allows you to assess whether the animal has distinct seasonal ranges. An animal that migrates should display a displacement curve that has a hump’ shape, where the animal is close to its winter range in late winter, then moves to a distinct summer range in spring that is a significant distance from the winter range, and then at the end of summer moves back to its winter range. There is a wide variety of displacement curves, and we recommend that you review the references noted at the end of this document. Note that you can plot displacement or Net Squared Displacement, whatever your preference, by adjusting the toggle on the analysis parameters tab. This page will load with the first animal and first year present in your database. From here you must use the sliders to choose the start and end dates for both the spring and fall migration. After choosing the general period of the spring and fall migration, you can then view the NSD SPRING and NSD FALL graphs to better refine the period you’ve chosen. You will notice as you select the migration periods, the map will also update. Spring migration points will be shown in green while fall migrations will be shown in orange. The map can be very useful for identifying animals with complicated movement patterns. You can zoom in to the map and more closely review the movement trajectories of the animal. Each point in the map represents the first location for the animal on a given day. The background of the map can be changed by clicking the upper right hand corner of the map. After you finish delineating spring and fall migration for each animal/year, click the NEXT ANIMAL/YEAR button to move to the next individual or next year of the same individual. It is inevitable that you will come across animals or years with erroneous data or when no migration occurred. If this happens, be sure to select the No migration present options under the headings of Does spring migration occur? and Does summer migration occur?. After proceeding to tab 6, you will see a blank map, which will be populated after the Brownian Bridge Movement Analysis has been completed. Click the Start Brownian Bridge button to start running the brownian bridge analysis. Using the Analysis Parameters tab, you can choose between regular Brownian Bridge or Dynamic Brownian Bridge, and the raster resolution (or cell size) that the Brownian Bridge analysis uses. The regular Brownian Bridge analysis takes much longer than the Dynamic Brownian Bridge. Further, the smaller the raster resolution you choose, the slower the Brownian Bridge analysis will take to complete. The analysis can take a few minutes to several hours. Running the sample dataset on a GIS workstation with a computer processor with 12 cores and 20gb RAM completed in 2 minutes using the Dynamic Brownian Bridge option and a raster resolution of 150 meters. Another trick to making the Analysis run faster is by properly specifying the number of CPU cores that your computer has on the Analysis Parameters page. After the brownian bridge analysis is complete, the output on this tab provides you a map of each individual’s migration corridors (and winter ranges, if you specified that you also wanted winter ranges to be calculated on the Analysis Parameters tab). See below for an example. Your results may look different depending on what dates were selected for each migration period. You can click on individual polygons to retrieve the animal ID associated with each polygon. low_use_2orMore_corridor.shp - Low use corridor that represents the spatial distribution of migration corridors containing 2 or more individual animals using them. med_use_corridor.shp - Medium use corridor representing the spatial distribution of migration corridors containing 10% or more of the individuals in the specified group. high_use_corridor.shp - High use corridor representing the spatial distribution of migration corridors containing 20% or more of the individuals in the specified group. Stopovers.shp - Represents the spatial distribution of stopover sites, calculated as the top 10 percent of the population level utilization distribution. winter_low_use_2orMore.shp - Low use winter range represents the spatial distribution of individual winter ranges containing 2 or more individual animals using them. winter_med_use.shp - Medium use winter ranges represents the spatial distribution of individual winter ranges containing 10% or more of the individuals in the specified group. winter_high_use.shp - High use winter ranges represents the spatial distribution of individual winter ranges containing 20% or more of the individuals in the specified group. CPU cores - This represents the number of CPU cores that Migration Mapper will use to run the Brownian Bridge Movement Analysis. The larger the number, the quicker the analysis will go. That being said, every computer has a limit, which will be determined by Migration Mapper and printed in the text of this parameter. We recommend using 1-2 less than the total number of available CPU cores on your computer. Maximum speed - Migration Mapper will remove GPS locations that are linked to unreasonable speeds (e.g., because of collar malfunction or the collar being in the back of a truck). You can specify what that threshold is here. Max fix interval - This is the maximum number of hours that can go between sequential GPS fixes before the Brownian Bridge Movement Analysis will not calculate a Brownian Bridge between them. Use Parallel Processing - If necessary, you can disable parallel processing when calculating Brownian Bridge. This will slow down the speed at which the analyses take to complete. Mortality parameters, minimum distance - Migration Mapper will remove GPS locations that are linked to mortalities (i.e., the collar does not move a specified minimum distance over a specified amount of time). Mortality parameters, Time unit - Migration Mapper will remove GPS locations that are linked to mortalities (i.e., the collar does not move a specified minimum distance over a specified amount of time). Raster resolution - This is the cell size for which the Brownian Bridge Movement Analysis will use. The larger the value the faster the Brownian Bridge analysis runs. However, decreasing this number will provide a finer scale estimate of migration corridors and winter ranges. Corridor Classification Percentile - This parameter represents the percentile for which a polygon is drawn around the utilization distribution calculated from the Brownian Bridge Movement analysis. The larger the number (i.e., closer to 1) the wider the corridors and winter ranges will be. Dbb margin - This represents the number of GPS locations on each end of a given trajectory of GPS locations that are used as ‘burn-in’ for calculating the moving window of the Brownian motion variance in the Dynamic Brownian Bridge analysis. The larger the number, the more GPS locations at the edges of each movement track will be discarded in the Dynamic Brownian Bridge analysis. This parameter does not affect regular Brownian Bridge analysis. Location error - This is the location error of your GPS collars. It is in meters. Window size - This represents the width (in number of locations) of the moving window for calculating the Brownian motion variance in the Dynamic Brownian Bridge analysis. Type of Brownian Bridge analysis - You can choose between regular (Horne et al. 2007) or dynamic (Kranstauber et al. 2012) Brownian Bridge movement analyses. Type of displacement to plot - You can choose between displacement or squared displacement during the displacement plots on tab 5 - migration dates. Calculate winter ranges or not - Do you want Migration Mapper to also calculate population level winter ranges, or simply calculate migration corridors only? Fine scale GPS collar data are best. 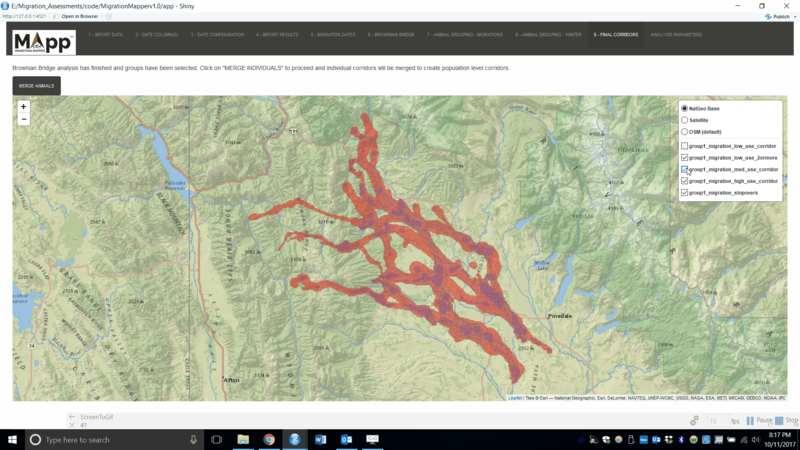 Based on our observations in Wyoming, you should not run the Brownian Bridge analysis with GPS collar fix rates that are more than every 5 hours for mule deer, or every 3 hours for elk. With higher fix rates, it is difficult for the Brownian Bridge Movement Model to accurately predict where the animal went. Verify that you have the latest versions of R and RStudio. Uninstall R and RStudio from your computer, and then reinstall both of these programs with the latest versions. Verify that you are running Migration Mapper using the “Run External” option in RStudio. Verify that you have removed GPS locations from before each animal was collared and after each animal’s monitoring period (e.g., after the animal died, after the collar was remotely released)? Verify that you are using a computer with our suggested features (i.e., 8 GB of RAM, Windows 64-bit operating system). You cannot run Migration Mapper on a Mac. Verify that you (logged in to your computer with your user name) have administrative privileges. Without these privileges, the proper analysis libraries cannot be downloaded and installed on your computer. If the analyses of Migration Mapper are running slow, try: 1) increasing the raster resolution on the parameters page; 2) increasing the number of CPU cores that Migration Mapper is allowed to use on the parameters page; 3) verify you are hooked up to a good internet connection; or 4) verify your are using a computer with at least 8gb of RAM, a modern processor, and a 64-bit operating system. Verify that you have no NAs or blank spaces in your animal ID columns or columns that represent date/time stamps. Zooming issues so that you have to scroll to see the parts of Migration Mapper. First, make sure Migration Mapper’s window is maximized (i.e., as large is it can be on your screen). Second, when you first start Migration Mapper and you are on the first screen, hold down ‘Ctrl’ button, and click the minus sign to zoom out. You may have to do this a few times to get all the tabs of Migration Mapper to show up and not be so zoomed in you must scroll around on each page to see it all. A good rule of thumb is to zoom out enough so that the Migration Mapper’s logo and all the tabs are on the same line at the top of Migration Mapper’s window. Migration Mapper is crashing after clicking “Run App.” You should uninstall R and RStudio using the add or remove programs feature in windows. Then, follow the instructions at the beginning of this user guide to download and install R, RStudio, and Migration Mapper. Doing so, will ensure you have the most up to date program and packages on your computer. "ERROR: invalid nchars argument." Assuming that you ahve the latest versions of R and RStudio installed, try copy and pasting "remove.packages('shiny')" into the RStudio R console and then press enter. Then copy and paste "install.packages('shiny')" into the RStudio R console and then press enter. Once you are done with that, close down RStudio, reopen it, and then try running Migration Mapper again. Upon initial installation, RStudio is giving error about 'cannot open file,' 'no such directory', or 'cannot open the connection.' If this is the case, you have not properly unzipped MigrationMapperv1.2.zip file, and are running MigrationMapperv1.2.r from the unzipped folder. Packages aren’t loading up properly or getting hung up, and I’m not getting to the welcome screen. First, verify that you are using the most recent version of R and RStudio. Then, simply try closing/exiting Migration Mapper, and then reopening it again. Börger, L., & Fryxell, J. M. (2012). Quantifying individual differences in dispersal using net squared displacement. Dispersal ecology and evolution, 222-230. Bunnefeld, N., Börger, L., van Moorter, B., Rolandsen, C. M., Dettki, H., Solberg, E. J., & Ericsson, G. (2011). A model‐driven approach to quantify migration patterns: individual, regional and yearly differences. Journal of Animal Ecology, 80(2), 466-476. Horne, J. S., Garton, E. O., Krone, S. M., & Lewis, J. S. (2007). Analyzing animal movements using Brownian bridges. Ecology, 88(9), 2354-2363. Kranstauber, B., Kays, R., LaPoint, S. D., Wikelski, M., & Safi, K. (2012). A dynamic Brownian bridge movement model to estimate utilization distributions for heterogeneous animal movement. Journal of Animal Ecology, 81(4), 738-746. Sawyer, H., Kauffman, M. J., Nielson, R. M., & Horne, J. S. (2009). Identifying and prioritizing ungulate migration routes for landscape-level conservation. Ecological Applications, 19(8), 2016-2025. Singh, N. J., Allen, A. M., & Ericsson, G. (2016). Quantifying migration behaviour using net squared displacement approach: Clarifications and caveats. PloS one, 11(3), e0149594. Copyright 2017 University of Wyoming. All Rights Reserved. Please click here to read the license agreement.